Fifty years on from its original publication, HLA Hart's The Concept of Law is widely recognized as the most important work of legal philosophy published in the twentieth century, and remains the starting point for most students coming to the subject for the first time.In this third edition, Leslie Green provides a new introduction that sets the book in the context of subsequent developments in social and political philosophy, clarifying misunderstandings of Hart's project and highlighting central tensions and problems in the work. 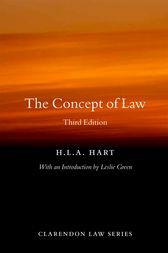 HLA Hart was Professor of Jurisprudence at Oxford University and the Principal of Brasenose College, Oxford. He authored The Concept of Law one of the seminal works of English-language jurisprudence. He passed away in 1992.Leslie Green is Professor of the Philosophy of Law and Pauline and Max Gordon Fellow of Balliol College, Oxford. He is the author The Authority of the State (Clarendon Press, 1990), and is the co-editor of Oxford Studies in the Philosophy of Law (with Brian Leiter).Joseph Raz has been teaching at Oxford University since 1972. He has been Professor of the Philosophy of Law there since 1985, and Research Professor since 2006; he has also been Professor at Columbia University since 2002. He is a Fellow of the British Academy and Foreign Honorary Member of the American Academy of Arts and Sciences, and has published a number of books including Between Authority and Interpretation (OUP, 2009) and The Authority of Law (OUP, 2009).Penelope A. Bulloch is an emeritus fellow of Balliol College, Oxford.